My laptop ( Compaq 420 ) is armed with CentOS 6. Freshly installed. There was some issue with the wifi driver, because of which I remained connected to a wired network. I sat and spent some time in troubleshooting it and landed up with solutions posted on CentOS forum. From the above output it’s clear that the laptop has a Realtek RTL8191SEvA Wireless device. Wireless works out of the box. DevOps Days is an open event which is typically considered as an interaction between what is traditionally considered as Development activity and an Operations activity. I added up to Operations activity for this two day event held at ThoughtWorks, Bangalore on 27-28 August 2011. There were talks, interactive sessions and OpenSpace sessions altogether. The first day began with a welcome talk by Ajey Gore, followed by talk by Nick Hines on Continuous Delivery. Nick was focusing on things like – basic fundamentals, automation, branching,right sizing, continuous improvements; Development practices like automation testing, code on mainline, branching by abstractions, non-functional automation testing, Build – development pattern : build-pipeline, canary releasing. Tooling: Chef, Puppet, CFEngine, Infrastructure as a Code. The other interesting talk given by speakers from Infosys – “Why is it difficult to do Test Driven Development and Continuous Integration in large companies ?” was an eye opener. Mainly because of maintenance, reliability and performance, feature release, investments in process automation, culture change, dependencies. Mirror environments , need for constant change, split of activities, maturity levels. These were those immense factors which made them think twice before adopting it and deviating from patterns. Test Load Balancer [ TLB ] was the talk which I liked the most ; it splits tests into multiple mutually exclusive and collectively exhaustive partitions and allows it to run in parallel to reduce build time. There were speakers from SlideShare who presented how they were able to build a system that deploys 5 times a day in a production environment. I attended OpenSpace sessions by techs from MakeMyTrip on Monitoring Systems using Nagios, Puppet, Ganglia. They also mentioned about identifying metric for monitoring, they have their own inventory system to deal with each clusters. I am not a Ruby guy but could definitely understand it’s power – Ajey & Nikhil spoke on Deployment Pattern in Ruby on Rails world. Ajey’s openspace session was the last thing I attended, went on for more that 45mins and got to know about reducing build times from few days to few hours using automated deployment. Things that they concentrate while setting up an environment – define a standard hardware, choose OS, configurations and provisioning them. Had a rich experience at the event followed by meeting some old faces too. It’s four years now since I am with Systems and working in Operations, but yes is DevOps solving issues like – (1) Afraid of changing once application is delivered. (2) Risky deployments (3) It works on my machine. The DevOps movement is still in its infancy, but it’s gathering pace – there are conferences, mailing lists, irc channels, blogs and people to get to know. I’m convinced this isn’t just a fad, and we’re on the brink of a revolution in the software industry – a paradigm shift in which developers and sysadmins start to work together, to train each other, and ultimately to blur the boundary – welcome to the world of the DevOps. Firefox: “Save and Quit” option disappeared ? I was finding it difficult to save my currently opened tabs whenever I quit Firefox browser ; later I learnt that up from Firefox 4, one change that has been brought is to by default stop Firefox displaying warning messages. It can be changed from the preferences. 1. Type about:config into the location bar and press Enter. 2. Accept any warning messages that pops up. You will be taken to list of preferences. The event kicked off with some technical talks by Y! folks. YQL, Geo-hacking and OAuth sessions were worth attending. Most of the applications developed during the hack used one of these. YQL turns data on the web into databases. Geo-hacking involved things like – finding a current location, turning a location into a place, finding geographical hierarchy, geo-tagging information, displaying geo-information. Learnt about BOSS [ Build your Own Search Service ], since the back-end is proprietary and owned by Microsoft, one has to pay 80cents per 1000 query. DuckDuckGo uses BOSS for it’s search engine. Did interact with Y! folks discussing stuffs related to systems rather than web scale applications. Got to know about happenings at Y! Labs. Hack challenges : Location based, Mobile based, Entertainment based. 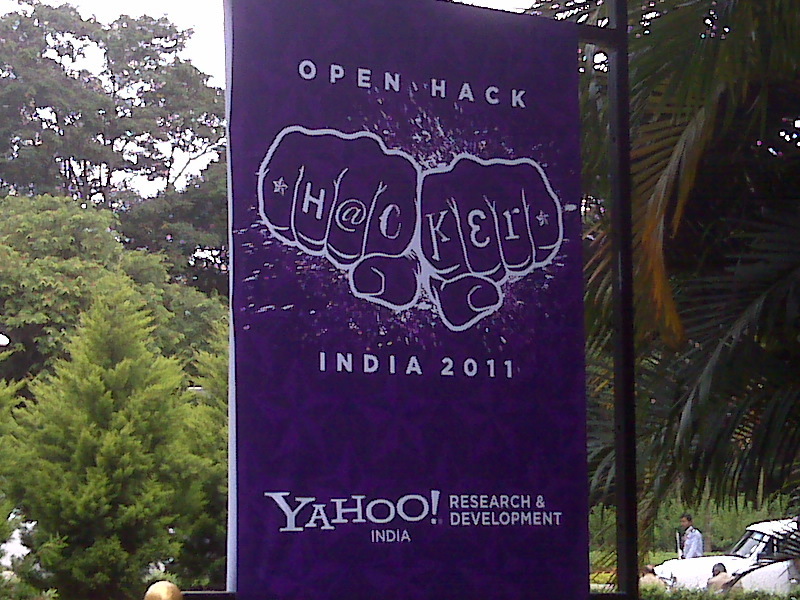 Hackers were asked to come up with applications using Y! open technology mostly available at Y! Developer Network and their latest open platforms. It was time to come up with some ideas and put them in some structure. Teams were formed and few did an individual hack as well. An applications named ‘FakeMyTrip’ wherein a user can put his photo to any fake location (s)he wish to visit, was applauded a lot. There were hardware hacks too – showing mind’s concentration while moving a remote control toy car, LED indicators which shows amount of CPU, memory consumed when a site is loaded, LED indicator glows red when a child tries to access unauthorised websites. 50 finalist were selected and they were given 90 secs to demo it. Grand prize was a trip to New York to participate in Y! Hack All Stars Event, where winner will compete with winners of other open hacks from around the world. It was a privilege meeting techies from Yahoo!. The event was a place of good learning and experience. How far will you get with “rm -rf /” on Linux ? Have you ever left your Terminal logged in, only to find a so called friend/ colleague came up and typed ” rm -rf / ” ? I actually did so on a virtual machine (VM). It’s a CentOS VM which was used for some applications test. I created a backup of this VM and thought of shooting a video as I proceed to run ” rm -rfv / ” on it. You can watch my video recordings here. I also did so to learn what all directories do not get deleted with this command. And also, after the command has executed will “rm” have removed itself ? It seems that OS protects certain directories like /sys, /proc, /dev. At the end of the video you can see that “ls” command is not found and so is “/bin/rm”. Needless to say /bin, together with /bin/echo has been deleted. So, issuing ” echo * ” just displayed * at the promt. I rebooted the VM and ended up with a black screen. OS is gone !! After the command finishes, disk is wiped off, including the OS. The Kernel and current processes will continue to run from memory, but many processes will die because they fail to access some file. OS will obviously fail to boot next time. Mistakenly, do not run this command on host system’s terminal. I did so on a VM, else you will land up putting your head on hand, hand between knees ! as one who’s world has just come to an end.